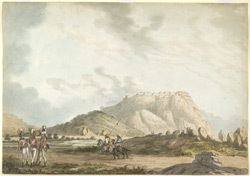 Pen-and-ink and water-colour drawing of Nandidrug with three English soldiers in the foreground and two Indian horsemen in the middle distance by Sir Alexander Allan, 1st Baronet (1764-1820), dated to between 1790 and 1792. Inscribed on the original mount in ink is: 'Nundy Droog.' This drawing is plate 10 from 'Views in the Mysore Country'. The soldier on the left with a red plume may be a Light Company man of the 71st Foot. In the centre with a green plume is a Light Company man of the 36th, and on the right with a white plume a Grenadier.